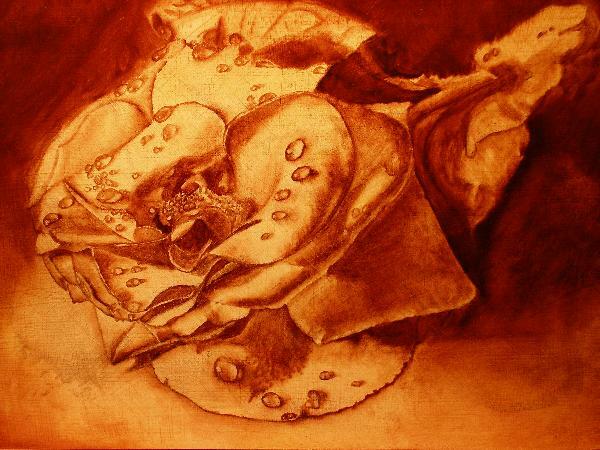 Red rose painting, a short example of a oil painting using the flemish technique. My main purpose here is to show just how much details can be included within the umber (brown) under painting. By doing each layer as well as you can, you save valuable time in the other layers as the work is already done for you in the previous layer. This painting was done on a masonite panel, and had a super smooth finish. 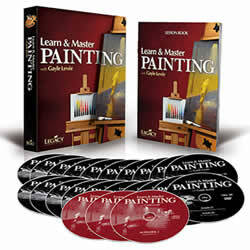 I show you how to achieve that here in this preparing a masonite panel. 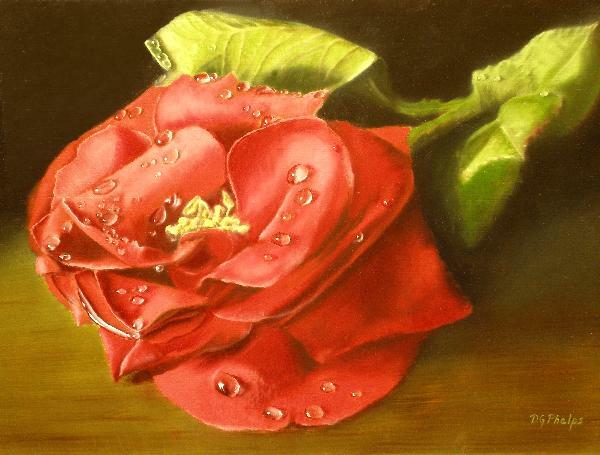 And here is the completed painting with all the dew drops and the fully developed blossom fresh from the garden! The foreground table top was merely a light reddish brown glazed over the original umber layer. I left some of my brush strokes to simulate wood grain, and I think I pulled it off. This was simply taking a "fan brush" loaded with a bit of burnt umber and red, and dragging it lightly side to side so as only a few bristles actually touch the panel. This left the reddish brown streaks that were then softened with my mop brush. Another thing to be sensitive to. Try to add little things into your paintings that will spark a bit more interest for your viewer. In this painting I included the back of a folded over leaf to show its veins and other structure. Some artists include bugs, butterflies, etc. These are great too! This was really a red rose painting by accident. Seeing this rose in our garden, I had cut several to bring in. As usual, this was an early morning excursion into my backyard to see if the deer had eaten my garden, and there was a heavy dew on most flowers. While preparing these for the vase, this particular fellow being heavy laden with dew kinda just flopped on the table. So much wetness made the petals open even more to reveal the yellow center. This is what caught my eye, and I quickly captured the moment with my camera. That's fine and well, but you wont see an image like this without the use of a camera. Why? The blossom will die long before you've captured this amount of detail. Remember, history shows us that the Masters of the Flemish and Italian schools used every tool at their disposal including primitive cameras to capture images. Not because they couldn't draw, but to simply speed up the process. Use every tool at your disposal to create your art. I certainly did with this full red rose blossom! How to paint a red rose.